This split level restored cabin is located approximately 16 miles north of Fredericksburg and only 10 miles from Enchanted Rock. Built about 85 years ago as a chicken house it is constructed of native rock from the ranch. 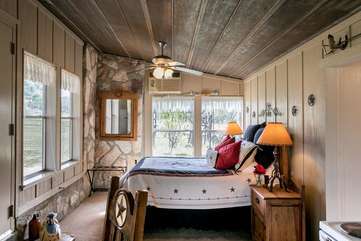 Found on a large working ranch this little cabin will offer comfort and privacy during your stay. Solitude is the word that describes this precious little cabin—if you are writing a book or just want to get in touch with nature—it is recommended that this is the place to stay. The first floor has a full kitchen with deer horn drawer and cabinet pulls plus a star “round” table and chairs. A queen bed is found in this open room and carries out the Texas “star” theme. The lower floor (2-3 steps down) of this split level home offers a comfortable leather love seat, a desk and satellite television with DVD. Enjoy the branding irons, chickens and roosters that have come back to the little “chicken” house only this time as décor. A bathroom is located on the lower level with a shower. Guests are welcome to walk in the pecan bottom of the ranch. Enjoy the ranch life as you may see the cattle and goats roaming about the property during your stay. There is a deer feeder in the pasture, which you can see from the lovely brick and rock patio just outside. TWO NIGHT MINIMUM ALWAYS THERE ARE SENSOR LIGHTS THAT WILL TURN ON IF WILDLIFE CROSSES ITS PATH! The perfect place to unwind and De-Stress. No sirens, no traffic, no loud people. Just you and Mother Nature. A place where time is lost. You won't want to leave. The owners, Betty and Ray have been Blessed with creating a little spot of Heaven on Earth. Its was our 2nd time using this company, that's because our 1st trip was wonderful as was the 2nd. We will stay in your cabins in the future as well. Thanks for excellent Service. Very Clean, nicely decorated, secluded. Very comfortable. Perfect for me and my friend loved it.